Opossum Control is a very common call the many wildlife control companys will get all thru the entire year. Opossum Control is often achieved by the art of trapping and should be handled by a professional. Opossums are very toothy creatures and will bite if put in the position of having to defend itself. 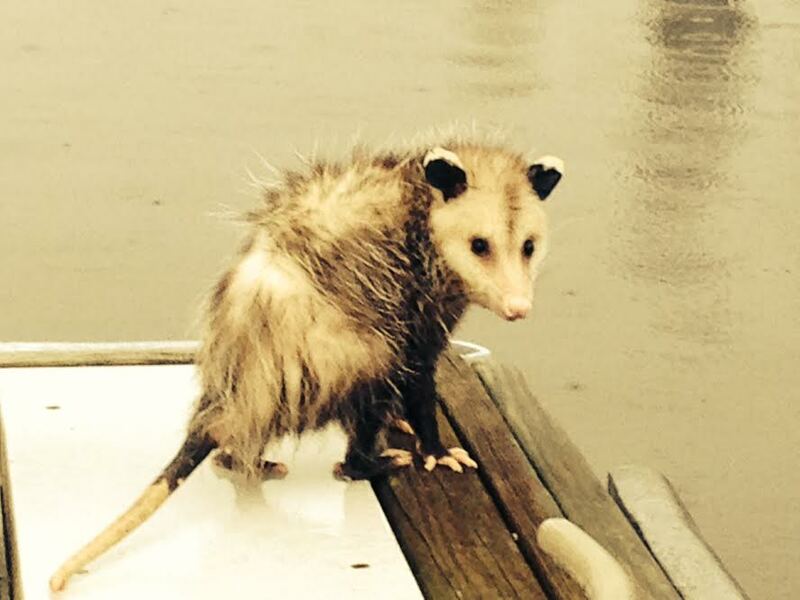 The photo that you see is of a sub adult male opossum that was stuck on a dock near Jacksonville, FL. As you can see they are a very mysterious looking animal. These animals are very odd in the way that they act. Have you ever heard of the expression playing opossum? I will explain exactly what that means. Possums are known for "playing dead" when they feel threatened, but this isn't quite accurate. They are in fact not "playing" dead at all: You see the possum goes into shock when stressed. While is it not dead, it can be found laying on its side with its four legs extended, the body of the possum is limp and unconscious during this time, like a person who has fainted. When drivers of cars a limp possum in the road, they don't bother to swerve, since they assume it's already dead. There are also accounts of people shooting the comatose possum in order to "put it out of its misery." It is a fact that a long lived opossum is only 3 to 4 years old. I have some opossum facts for you, this really is a very unique animal. Its actions and totally crazy looks make it one of the coolest animals ever. They are Omnivorous, Eat many different things! The most common forum of possum control is the use of traps, Possums are known to eat a variety of foods so the art of trapping the animal is pretty simple. The problem with this animal is not the trapping aspect of the situation, it is what you are going to do with the animal after you trap it. All this is where a professional trapper comes in. They will handle the situation from start to finish and remove the animals according to all local laws. You can find a list of professional wildlife removal companies here. But id you are a homeowner that wishes to attempt to trap the possum themselves, then we have come up with a trapping opposum page.